A warrant has been issued in connection with the June 5, 2009, robbery at National Beef. Cesar Martinez-Sanchez, 30 H/M, a.k.a. 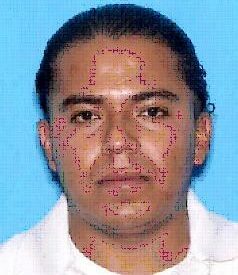 Julio Villanueva, is wanted for aggravated robbery, 2 counts of aggravated assault, identity theft and theft. On June 5, 2009 at about 9:56 a.m., officers from the Liberal Police Department were summoned to National Beef, 1501 E. 8th, for a report of an armed robbery. Officers from the Liberal Police Department, Seward County Sheriffź? ?s Department and Kansas Highway Patrol quickly set up a perimeter around the plant. A police K9 was summoned to assist with a track of the suspect. The suspect was described by witnesses as a Hispanic male dressed in black, standing about 5 feet 7 inches tall, with an average build. Witnesses believed he was armed with a weapon. The suspect demanded and received an undisclosed amount of cash before fleeing the area. No injuries were reported. Police are still looking for a vehicle leaving the area at about the time of the robbery. The vehicle is described as a blue, Jeep Liberty with no spare tire cover and tinted back windows. The tag is unknown. It is believed that Martinez-Sanchez fled in this vehicle. Anyone with information is encouraged to call the Liberal Police Department at 626-0150 or the Crime Hotline at 624-4000. Police consider Martinez-Sanchez to be armed and dangerous. Anyone providing information leading to the arrest of Cesar Martinez-Sanchez is eligible for a cash reward.